Descriptive Sentences: What is old becomes new. One of the benefits of switching work locations is activities that seem old in one school can become new to another group of students. I don’t like hauling a lot of materials around so sometimes I need to think of new ways for adapting my materials to adjust to new goals. 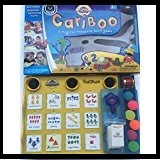 This last week we had fun with the game of Cariboo. Many of you may have this game but it can be hard to find since it is no longer being made. Don’t worry, you can make an alternative. If you click on the picture below it will take you to a previous post of mine about a game you can make that would work for this activity. You just need to switch the pictures out and provide an incentive or clues under the covers. Activity Tailor also posted some alternatives to the Cariboo game. Just click on the name and it will take you there. You would think this game is mainly for the younger set, however I had 4th and 5th graders that were enthused to play. There is something about clues and a secret that just arouses curiosity. I thought once they discovered what was in the treasure box they would want to stop, but they asked for another round. I did some adapting to make Cariboo relevant for the older students who were working on developing more complex sentences. 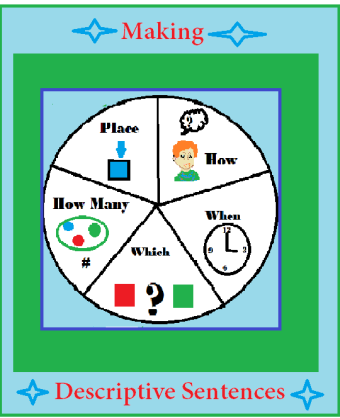 I inserted pictures for using pronouns and a variety of verbs for some of my younger students. I brought out my spinner for making descriptive sentences for the older students. I had students pick a picture on the Cariboo game, spin the spinner and add what the spinner selected to a basic sentence describing the picture. They could then open the door on the Cariboo game and look for one of six balls that are needed to open the treasure chest. 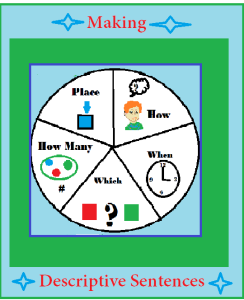 To get the descriptive sentence spinner just click on the picture at the top of the page and it will take you to my TPT store where you will find it. It is a free download. 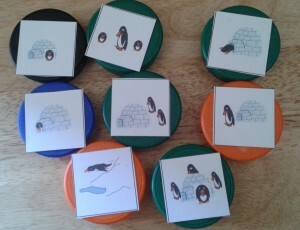 I bought the pronoun cards from another TPT store made by another SLP for the Cariboo game. You probably have some of those cards in some form already. I used this same activity for my articulation students who labeled the pictures or described them. It was a good way to practice using speech sounds in spontaneous sentences. Because they had to think up the sentences it was a little more challenging then imitating or reading sentences. I hope I have helped with your lesson planning for this week.